A few weeks ago Motor Trend published an article indicating that the Porsche 918 Spyder is no slouch compared to the lighter, more powerful McLaren P1 around Mazda Raceway Laguna Seca. Despite a horsepower-to-wieght ratio deficit, the 918's all-wheel-drive and massive torque were enough to undercut the McLaren's lap time by nearly a second with race car driver Rand Pobst at the wheel — and achieve a new production car record at Laguna Seca. 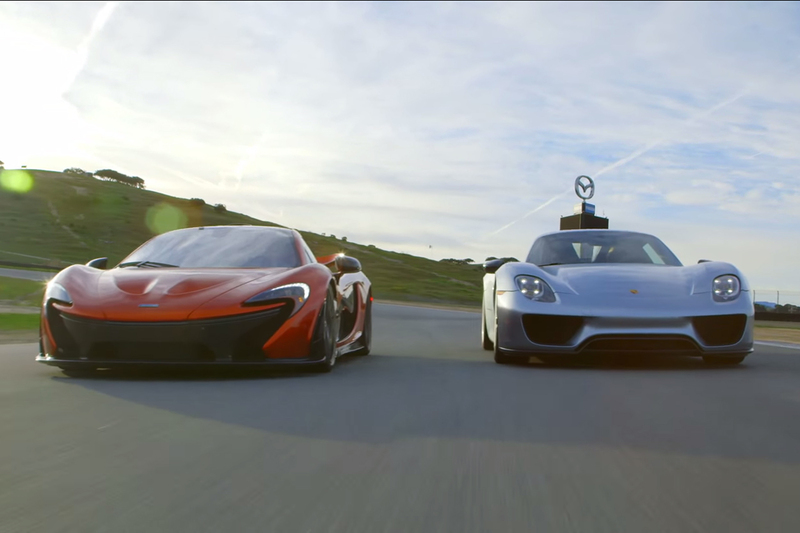 Now you can watch the two hybrid supercars battle it out in the latest episode of "Head 2 Head." You'll notice that the LaFerrari is missing from the comparison, but it wasn't for a lack of trying; Ferrari wouldn't allow the publication to record and publish track data of its fastest car. No matter, Pobst gives his usual excellent insights into the driving dynamics of the subjects at hand and comes away impressed by both for different reasons. The P1 may be the driver's car of the two — the 918 is the better all-rounder — Pobst says, but that doesn't stop the Porsche from dominating on track and offering up loads of fun. Scroll down to watch the 22-minute video feature.